Nobel laureate and TIME magazine’s Person of the century Albert Einstein changed our understanding of the world as we knew it unlike any other scientist. In 1905, hailed as the renaissance year for science, Einstein published four research papers and toppled over 200 years of scientific fundamentals with theory of relativity giving, perhaps, the world’s most famous equation, E=mc². 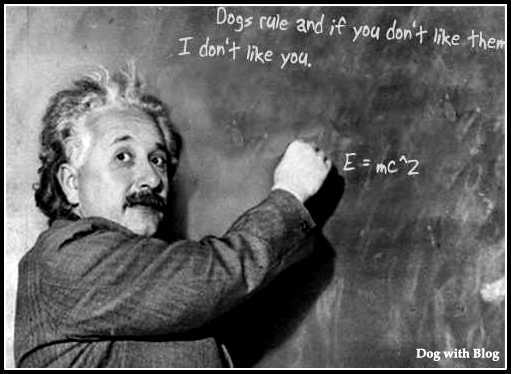 Theory of relativity, Dog lover’s axiom. Known as the father of modern physics, a synonym for genius, Einstein was fond of animals and enjoyed the company of cats and dogs around him. As the principle pillar of this dog’s favorite science triad, Einstein along with Nikola Tesla and Sir Isaac Newton have allured many of my recent discoveries about cat colonies in galaxies beyond Milky Way. I would divulge more on them after sending a test subject (read: the human being) to far off space, a giant leap for canine kind. Any volunteers? For perhaps the greatest genius who walked the face of this planet, Einstein did have those stellar moments of sheer brilliance and absent-mindedness alike; that idiosyncratic trait that you associate with the gifted. Photographer Arthur Sasse captured this iconic ‘tongue-stuck-out’ photograph of Dr. Albert Einstein on the latter’s 72nd birthday. 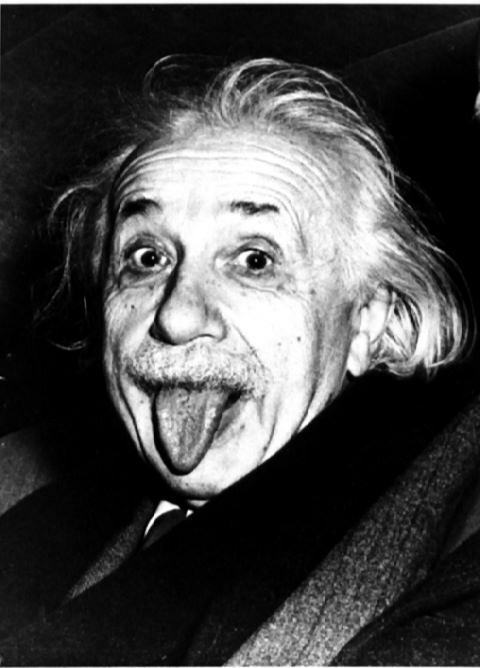 Having smiled for photographers many times during the day, Einstein stuck out his tongue instead. While Einstein lived in Berlin, working as a patent office clerk, he did his research work in a small study away from his home. In this study, he kept a large number of cats, of which he was very fond. However, the cats at times could be rather burdensome, scratching persistently at closed doors, demanding to roam freely throughout the house. He could not leave all the doors open, so he decided to cut holes in the bottom of the doors, producing cute little cat doors. In that year, he had roughly equal numbers of large and small cats. Therefore, quite logically, he cut out two holes in each door: a large one for the large cats and a small one for the small cats. It made perfect sense. 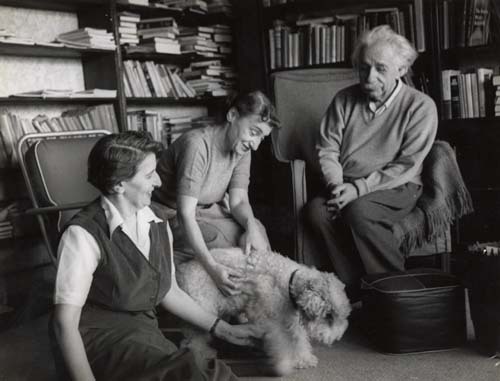 Albert Einstein with friends and dog in Princeton, New Jersey, 1953. Image copyrights with LIFE photographer Esther Bubley. 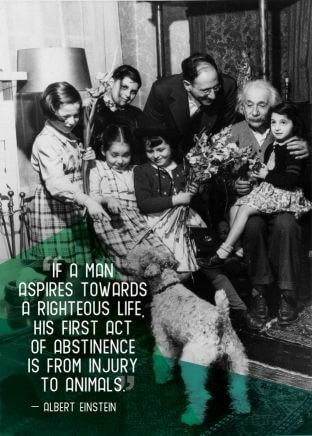 Einstein was of the opinion that everyone was bestowed with unique gifts and was critical of examinations, which he felt were unnecessary as anything that could be looked up in a book wasn’t worth remembering. Hope you liked the witty side to Albert Einstein. And now my friends, drawing an inspiration from the genius I too must return to my quest SETCI (Search for Extraterrestrial Canine Intelligence) project. Behind every genius is an even bigger genius that is four-legged! haha, the cat story was funny! I’d heard it in a different context (mama cat and her kittens) and for Isaac Newton. 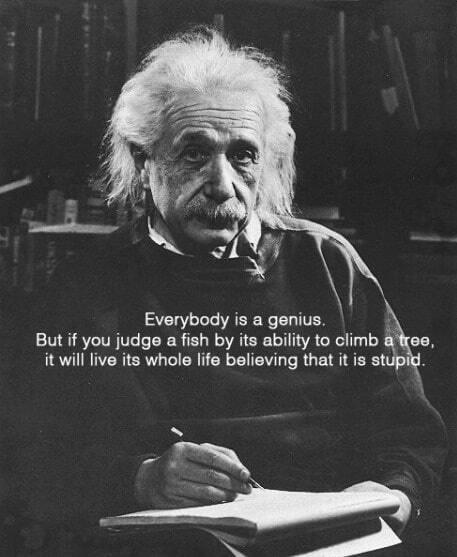 All the geniuses have so many facets to their personality, they inspire in a multitude of ways! Funny are the dimensions through which geniuses shine, a kaleidoscopic imagery for sure. “anything that could be looked up in a book wasn’t worth remembering” This would have to be the best quote ever! I actually didnt know about the cutting cat holes in the bottom of doors either. So maybe it was Einstein who invented the cat door! Why would this genius have a small door for small cats and a big door for big cats? Think about it and you will quickly understand his genius. I don’t get why he cut two holes. If large cat go through a hole sure small cat go through. Why two separate hole though. Previous Previous post: Roopkund trek review, over the hills and far away.